Woodland Villas offers premier townhomes in Southwest Gainesville. These spacious alternatives to apartments provide residents with high ceilings, large closets, loft-style master bedrooms, and extra storage, and select units include a courtyard or optional study for privacy. Whether you're new to Gainesville or want to escape the noisy downtown apartments, you'll find Woodland Villas to be a welcome change of pace. 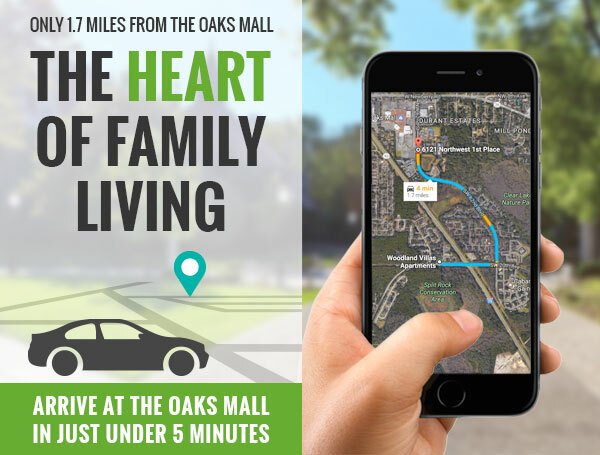 Our quiet neighborhood is located right in the heart of west Gainesville, meaning you're minutes from The Oaks Mall, I-75, Newberry Road, Archer Road, Tower Road, and 34th Avenue. From here, you have access to the best of Gainesville. From shopping and dining to parks and professional plazas, you can live, work and play. When you're looking for an apartment, condo or townhouse in Gainesville, FL, you want to know you're getting the best in amenities. Woodland Villas offers amazing apartment amenities and community amenities, and best of all, it's a pet friendly community. Inside, you'll enjoy the convenience of ceiling fans, dishwasher, garbage disposal, kitchen pantry, outside storage with washer and dryer hookups, and skylight, all of which make living on your own or with a few roommates a breeze. With high ceilings, large closets, patio or balcony, there's plenty of space to relax and get comfortable. Around the community you'll have access to laundy facilities, optional private courtyards, a pool, sundeck and public transportation so you can explore Gainesville at your leisure. Or, take the bus and skip the morning commute. Our town homes for rent are waiting for great residents just like you who want an affordable place to live. Woodland Villas is located near some of the best schools around. When you're ready to move to a new apartment, choose a townhouse for rent at Woodland Villas. Our townhouses offer a great location, convenient amenities, and independent living that you won't want to miss.